The Greek word for "church" is "ekklesia". It means "those who have been called out." We have been called out of our old lives and into a new life with Christ. Being part of the church requires boldness and courage. The church has not always experienced the peaceful times we've been privileged to live in. God's power is available for us to testify and live for God, even if it involves suffering. We were saved before we could live a holy life and not because of anything we have done, but all because God showed His amazing grace through Jesus His Son. Jesus has been there from the beginning of time, appeared to us (to reveal what God is like), died to be our Saviour, destroyed death and sent His life-giving gospel into the world. We have been called! Called to live a holy life in response to what God has done! This is a high call and a high privilege. We're not called to do it alone, but as a community. We are called by a loving God. Our community does not lie in the strength of an organisation or denomination but in the One who calls. We are called to come out of an old life that is centered around self and selfish pursuits to live for God and for a world that needs us to be heralds, apostles and teachers of the good news that is the gospel. God makes us His co-workers. He puts His reputation in our hands. He asks us to tell the incredible story of what His Son did for us! What is CH--CH ? The answer is: U R! The image of Shepherd and flock is a powerful theme in Scripture. Ps 23 and John 10 portray God as Shepherd, Good Shepherd and the one who provides, guides, accompanies and protects. The image of the flock is that it should be protected, nurtured and that it should stay close to the shepherd. In the Old Testament the flock is often depicted as faithless and rebellious. It is often seen to be scattered by lions and captured by enemies because they have strayed or have chosen false shepherds who have looked to their own interests. Here in Acts 20, Paul is saying farewell to some of the elders of the congregation in Ephesus. He is heading to Jerusalem where he knows he will be arrested and go to Rome. This is the last time he will see them. With "last words" urgency he leaves them with this charge: Lead the church but do it as shepherds of flock that belongs to the One who bought it at great cost. As the church we are a flock - we need to be together, we need to be shepherded, we can't do it on our own and we belong to the Great Shepherd. This goes against the pride and independence of the current age. Modern humanism says that we should depend on no-one, that we should individualise and self-actualise. The Bible calls us a flock. We need each other and we need a shepherd. We also need to lead responsibly. Anyone who feels called to lead should spend some time reading Ezekiel's denouncements of the hireling shepherds who misled Israel. (Eze 34 - It's incredibly scary reading!!) Paul calls the Ephesian elders to be shepherds of a flock that was bought at great price: The blood of God's Only Son. Jesus is the only truly Good Shepherd. At best we are only under-shepherds. The flock is His - He laid down His life for us. He gave everything for us. We're a flock. I need to be humble enough to admit that it's not all about me. I need to recognise that I need my fellow sheep and I need to be shepherded. I need to admit that I go astray. Often. And I need the Good Shepherd to rescue me and that I am safest in the flock. When we are called to lead we should be extra humble. It's not our flock. People often ask me how things are going at my church. I have to keep saying: "It's not my church, it's His, I just work there!" I must follow the footsteps of the Good Shepherd. We belong to a Shepherd who loves us and gave His life for us. The church is a field. God sows a glorious seed into our lives and if we are the "good soil" that Jesus describes in His parable, then the seeds grow into fruitful plants that bless and inspire the world. The Corinth Congregation liked to argue about their star-preachers. Apollos was a gifted preacher who was good at explaining the Old Testament. Paul had an exciting testimony - not many people were met as dramatically by God on the Damascus road as Paul (aka Saul) was. The congregation had developed fan-clubs and favourite preachers. They were so loyal to these human preachers that it was splitting the church. But Paul blows this out of the water. As God's people - the church - we are like a field. Paul and Apollos are merely seed-planters and seed-waterers. Seed-planters and waterers come and go but they can't make seeds grow. Only God can! The seed is the Good News about Jesus Christ. Only God, by the power of the Spirit working in us, can make the seed grow. When we were driving down to the Cape for our long leave, we drove through fields and fields of sunflowers in the Free State. 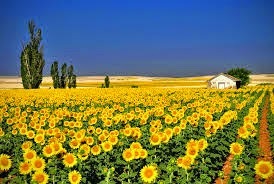 These beautiful flowers were the "fruit" of plain and ordinary seeds that a farmer planted and watered. These seeds grew into beautiful plants that were beautiful to look at, provided oxygen through photosynthesis, seeds for sunflower oil, flowers for florists and seeds for another planting. What we didn't notice while we were looking at the sunflowers was the field. Underneath the flowers was a field. The seed are sown in the field. The water is poured onto the field. The seeds grow in the field and the fruit is harvested from the field. The church is a field. God sows a glorious seed into our lives and if we are the "good soil" that Jesus describes in His parable, then the seeds grow into fruitful plants that bless and inspire the world. This is what healthy farms do - you don't see the workers, you don't see the soil, you see the crop and the yield. May we, as the church, be the same! will never be put to shame." We're stones - not bricks (bricks are all the same) in God's building. By this image Peter is conveying some important truths about the Church. These truths can be divided into two parts: Firstly there are truths about Jesus. Peter identifies Christ as the cornerstone and capstone of the building. The cornerstone was important, because the Master Builder would lay the cornerstone and the labourers would use the cornerstone to get the orientation of the building correct. All building was done with reference to the cornerstone. The capstone is the stone at the top of an arch and in a sense brings together two opposing forces. The higher the arch, the more impressive the capstone. The church is founded by Jesus and He is its foundational cornerstone - He defines the orientation, purpose, and direction of the church. But He is also the capstone - He is to be lifted up and glorified by the church. Secondly, we must look at ourselves: the stones. Stones in a wall are all unique and each has a part to play. We have to find our fit in the walls of God's building. Sometimes we struggle with the stones who are next to us. Sometimes they let us down or frustrate us. Our commitment to being God's building is tested at this point. Can you imagine a wall of stones bickering at each other? There are unfortunately some churches that are like that - they have forgotten the Cornerstone and the Capstone. Have you found your fit in God's building? Are you guilty of looking at the other stones instead of the Cornerstone and Capstone? Are you using enough mortar? The body is a unit, though it is made up of many parts; and though all its parts are many, they form one body. So it is with Christ. For we were all baptized by one Spirit into one body--whether Jews or Greeks, slave or free--and we were all given the one Spirit to drink. The body - an amazing topic of discussion and reflection. Watch a gymnast do their thing or the precision of an artist. Think about the miracles of hugs, smiles, singing and sight. Our bodies can do all these things. There are many parts, but one body. It's made of different parts, but all are needed. It is unified under the headship of Christ and the bonding power of the Spirit. It is able to do amazing things through the diversity of the parts. Through the body we are able to share sorrow and rejoice in blessings. Western Christianity in particular is guilty of moving in the direction of "lone-ranger Christianity." Paul's picture of the church as a body is both vibrant and beautiful and a great corrective to individualism. What part of the body might you be? I think I might be an elbow - the kind that jabs you in the ribs to remind you that God loves you. Have you taken some time to look at the family of believers that you have in your local congregation? Can you see the same magnificence and potential that I described in the opening paragraph? We started this section on the church by noting that the church is built on the creed confessed by Peter - that Jesus is the Christ (Messiah), Son of the Living God. In the next few days we're going to look at a number of images for the church: A body, a building, a field and a flock. As we look at each of these images we'll see that the person and work of Jesus is central in each of these images. Our reading from Colossians is a tremendous statement of who Jesus is and what He does. He is the head of the church which is His body. We could spend a couple of days looking at the bullet-points above. (And maybe we can do that after the Creed series is finished...) But here's the point: The church is always about its Head. The church is not the be-all and end-all. Jesus is. Throughout history and in our lives the church, when it eclipses Jesus, becomes irrelevant, broken, decrepit and damaging. A body without its head cannot function. When we are not clear about who the Head of the church is, we are headed for trouble. Take some time to read Paul's words again and be "lost in wonder, love and praise!" The word "catholic" is often misunderstood. In the context of the creed it does not mean "Roman Catholic" but rather it means "universal" or "all-encompassing". It comes from two Greek words: kata (according to) and holos (whole) and indicates a sense of wholeness and inclusivity. We talk about someone having a "catholic taste in music." This doesn't mean that they like church music, but rather that they like all kinds of music. Paul makes this point powerfully in Galatians 3. The church is not about race, status or gender, but about the fact that we are clothed in Christ and therefore one in Him. This is a vital truth to embrace. We are not the same, but we belong to One Church. When we talk about the Church we are talking about all who belong to Christ: protestants, roman catholics, orthodox, pentecostal, charismatic, baptist, etc - it doesn't matter as long as we own Christ as our Lord and Saviour. We are one in Him. It has been nice, over the last 25 years to see the boundaries between denominations coming down and see all the branches of Christ's Church working together. It has also been nice to see how our congregations are made up of people of different cultures and races. That's what being catholic is all about. So... why not use the word "universal" if "catholic" is misunderstood? Well, "universal" doesn't quite capture the sense of inclusivity (wholeness) that "catholic" does. And at the end of the day, we must remember Jesus' prayer for us in John 17 - "That they may be one..."
We're still looking at what it means when we talk about the "holy church". There are two dimensions to the church's holiness. On the one hand holiness is an event - it is to be justified - the letter to the Hebrews puts it like this: "we have been made holy through the sacrifice of the body of Jesus Christ once for all." (Heb10:10). This is what we looked at yesterday. Today we look at holiness as a process and we call this sanctification. In Afrikaans the word is "heiligmaking" (holy-making) which is beautifully descriptive of what this is all about. When we surrender our lives to Christ, He fills us with His Holy Spirit who begins to work in us. Paul talks about the fruit that the Holy Spirit cultivates in our hearts: Love, Joy, Peace, Patience, Kindness, Goodness, Faithfulness, Gentleness and Self-Control. The goal is that our lives slowly but surely become more in-tune with God's nature and God's will. And God is holy. So, the church is in the process of looking more and more like Jesus. This needs to reflect in the individuals that make up the church and in the way that the church as a gathering of people behaves. My personal life needs to be guided by Jesus' example of integrity, obedience to the Father and love. Our meetings need to be conducted with kindness and grace. When we become more and more like Jesus we are becoming holy. Holiness isn't a standard as much as it is worship. And fortunately we don't have to try and do it by ourselves. Have a great weekend and use Sunday to thank Jesus who made you Holy and ask the Holy Spirit to help you become more like Jesus. When we talk about the Church, "holy" is not a word we feel very comfortable using because many people have experienced judgementalism and holier-than-thou attitudes from church people. On the other hand we have been appalled at the failure of church people and church pastors who have been crooked, abusive, hypocritical and broken. So how can we talk about the Church as holy? Well, to properly answer that question we need to use two theological words: "Justified" and "Sanctification." The first word is an event and the second describes a process - we'll focus on the event today and the process tomorrow. To be justified is to be brought to a place where justice has been satisfied. Paul explains that this is what Jesus did for us: He loved us and gave himself as a sin offering to make us holy. This means that regardless of our practical and daily failures there is an event that balances the scales. In spite of our brokenness and sin, there is a game-changing moment that took place. The justice that our sin deserved was handled on the cross. When God looks at us from a justice point of view He sees us in the light of the Good Friday event. He sees us "without stain or wrinkle or any other blemish, but holy and blameless." This means that the church is not a showcase for saints, but a hospital for sinners who get to stand behind a wonderful Saviour. Thank You Lord Jesus for making us holy - We know it came at great cost. Amen. Welcome back after our holiday gap in EmmDevs! We're resuming the series on the Creed and we get to the line: "I believe in the holy catholic church." We're going to explore this phrase in quite a bit of depth for the next few days. There are only two places in the Gospels that Jesus uses the word "Church" (here and in Mt18:17). This is understandable because His earthly ministry was to announce the arrival of the Kingdom of God. After His death and resurrection the Church would be born at Pentecost. But Jesus makes His intention clear here: He intends to build His church. But what kind of church will it be? What will its purpose be? And who can be part of this church? These are questions we must ask over the next few days. The starting point of any building is its foundation. Jesus has been asking the disciples' opinion as to His identity. Peter nails it: "You are the Christ - the Son of the Living God." Jesus makes a startling declaration in response to this. "On this rock I will build my church." Historically there has been some confusion about this because the name "Peter" (Petros in Greek) means Rock. But Jesus talks about building His church on "this petra" (which is the neuter form of petros). The petra is not Petros but the confession that he has just made. Even without the help of the Greek, just looking at the text makes this obvious. It is the question of Jesus identity that is key. Simon-Peter is not so special for seeing this: God revealed it to him - which makes his confession all the more true. The Church stands on this solid foundation: "Jesus is the Christ(Messiah), the Son of the Living God." When we build the church on other personalities and ideologies it does not last.